16 November 2010, at 10:06a.m. 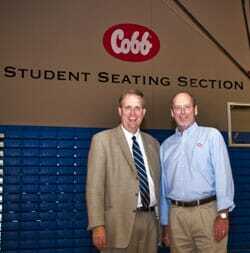 US - Tyson Foods and Cobb-Vantress have made a gift of $150,000 to John Brown University towards the construction of the Bill George Arena at Siloam Springs, Arkansas, US. The arena provides a much-needed athletics facility and community gathering space with a 2,400-seat capacity, replacing a small 50-year old athletics centre. The Bill George Arena has already hosted National Association of Intercollegiate Athletics volleyball and a sold-out concert, with Golden Eagle basketball holding its first game there on 28 October. John Brown University is a private Christian university, ranked second by US News & World Report in the Southern Region. JBU enrolls more than 2,000 students from 42 states and 45 countries. It is a member of Arkansas’ Independent Colleges and Universities and the Council for Christian Colleges and Universities.